Ken Liu is an author and translator of speculative fiction, as well as a lawyer and programmer. A winner of the Nebula, Hugo and World Fantasy awards, he has been published in The Magazine of Fantasy & Science Fiction, Asimov's, Analog, Clarkesworld, Lightspeed and Strange Horizons, among others. Ken's debut novel is "The Grace of Kings" (Saga, 2015), the first in a silkpunk epic fantasy series. Saga is also publishing a collection of his short stories, "The Paper Menagerie and Other Stories" (Saga, 2016), excerpted here. Liu contributed this article to Space.com's Expert Voices: Op-Ed & Insights. Animals come in all different sizes, but the laws of physics mean that you can't just arbitrarily scale up a dragonfly to the size of an elephant and expect the body plan to result in a functioning creature. For one thing, mass increases much faster than other qualities like strength or surface area as you scale up a body, and so the legs and wings of an elephant-size dragonfly would have to be proportionately much larger to support the extra weight — and it's doubtful muscle power could be sufficient to propel such a creature into flight. Moreover, insects are generally small because they rely on diffusion to distribute oxygen to interior cells instead of the active oxygen-pumping systems found in animals like mammals. This imposes an upper limit on just how big an insect can get. It's true that there were gigantic dragonflies — still not the size of elephants, however — during the Carboniferous period (as well as housecat-size cockroaches and other horrors), but the oxygen level in the atmosphere at the time was much higher, and that likely played a role in making such bodies viable. Let's pause for a moment and give thanks for the fact that we don't have to live in a world of pet-size cockroaches and meter-long scorpions. All of this presents an analogy for fiction. It's tempting to think of novels (the elephants) as scaled-up short stories, or short stories (the dragonflies) as miniaturized novels. But having written both 100-word drabbles as well as 200,000-word epic fantasies, I can assure you that's not the case. Because a short story is a different reading experience than a novel, the ways in which short story writers craft their words can't be simply scaled up for use in writing novels. It hovers, darts, skims along the surface of consciousness. It relies on quickness and stealth to seize the emotional payload. It can be beheld as a whole in the mind and admired in its entirety. It breathes by diffusing its thematic metaphor throughout every word. It can get away with ostentatious experimentation in body plan — and now we're comparing stories to insects in general — so that nontraditional narrative techniques can be used without risk of exhausting the reader. It demands sustained attention from the reader. It requires a fully fleshed out world that must be slowly experienced and grasped in pieces much as the fable of the elephant and observers without sight. Because it cannot be understood all at once, it requires a clear structure to guide the reader through interlocking plot lines. It breathes and lives by regular rhythms, by well-understood beats, and is generally resistant to "too much" experimentation — at least in most genres — since immersion is a prized attribute for many readers, and immersion is generally achieved by sticking to shared reading conventions. "The Paper Menagerie and Other Stories", by Ken Liu. This isn't to say one is harder to write or more fun to read than the other, but to acknowledge that the short story writer must solve different problems subject to different constraints from novelists. When I write short stories, I generally don't outline at all. I can proceed by instinct and experimentation, feeling my way and sculpting the story piece by piece while the shape of the whole is held in my head. The single plot line tends to be sufficiently simple that it does not require a great deal of note-taking, and the themes can be woven into the narrative during drafting. And if the draft turns out to be unsatisfactory, there's generally not enough invested that I cannot bear to throw it away and start from scratch. But when I learned to write novels, the experience was very different. I found an outline (at least a rough one) necessary because it was the only way to be sure multiple plot lines functioned together. The world of an epic fantasy novel consisted of so many details — characters, habits, cultural touchstones, fauna and flora, magical systems, religious practices, holidays, weapons, military tactics, quirks in the economy — that I had to take detailed notes and write explanatory essays to myself to keep it all straight. Barlowe's Daggerwrist is one member of the menagerie of creatures that inhabit the artist's imaginary planet, Darwin. Living exclusively in the dwindling pocket-forests of the planet, these social, arborial creatures — Barlowe tells us — have "piton-like forelimbs, gliding membranes and powerful ricochetal hind-limbs" that make them "perfectly adapted for life in the tree-tops." Indeed, I ended up creating a mini-wiki for my world just so that I could inhabit it and move around effectively. It is certainly possible to try to write a novel as an extended short story and vice versa, but I suspect the results would not read as well. The rules of narrative logic and interpretive conventions are almost as powerful as the laws of physics, and works that aren't cognizant of them and use them to the benefit of the story may well suffer as a result. 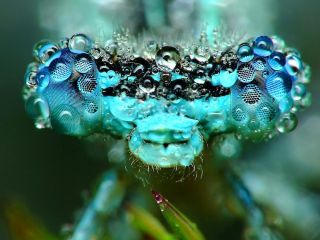 Yet, it is fascinating to think about how we can, as both writers and readers, challenge the conventions around these forms and infuse the atmosphere, as it were, with more oxygen so that we facilitate the creation of experimental forms that are as magical as elephant-size dragonflies that soar into flight. For more, read "The Bookmaking Habits of Select Species," an excerpt from Liu's latest collection of stories, his essay on silkpunk technology, and an excerpt from his novel "The Grace of Kings."